Asian Tsunami: Lessons from the Survivors: Why coral reefs and mangroves protected and saved many lives and concrete structures succumbed and could not protect? When the devastating tsunami struck several nations around the Bay of Bengal and the Indain Ocean on the 26th of December, 2004, areas covered with coral reefs and mangroves did not suffer much damage and protected the people inland. On the other hand, many buildings, resorts, an air force base, highways and bridges and other concrete structures collapsed. Can man-made structures ever be substitutes for nature? When the Tsunami washed away the lives and livelihood of more than 2 lakh people in Southern Asia, it also washed away many man made structures including buildings, resorts, highways, houses and even an Indian Air Force base at Car Nicobar. But in areas where there were extensive coral reefs and intact mangroves, the loss of lives and damage appeared to be much less than those where the reefs had been damaged and the mangroves ripped out and replaced by prawn farms and poorly planned beachfront hotels. In Surin Island off the Thai coast, not far from Phuket, only a handful of people are known to have died. The ring of coral in waters around the Surin Island mostly held firm when the tsunami struck and saved many lives. It both broke the force of the tsunami and acted as a kind of early-warning system: people saw the waves breaking against the reefs and scrambled for safety. The loss of human life was very much less at Marriott hotel in Phuket, Thailand. The hotel, developed with strict environmental guidelines, was built back from the beach and development of the waterfront was severely restricted, so mangrove swamps were preserved along the coast. It is reported that mangroves in Ranong and Phang Nga in Thailand saved hundreds of people. In India’s southern state of Tamil Nadu, areas in Pichavaram and Muthupet with dense mangroves suffered fewer human casualties and less damage to property compared to areas without mangroves. In Pichavaram, 6 hamlets under physical coverage of the mangrove wetlands did not suffer any damage, seawater did not enter into the village and there was no loss of property. But hamlets located on or near the beach were totally devastated. The coast between Nagoore and Nagapattinam saw relatively less damage because of a government campaign to put up plantations; only two deaths were reported from this forested area. On Penang Island, the worst affected area in Malaysia, there was reduced property damage and less impact on the coast in areas where the mangrove forests were intact. Simeuleu island, only 40km from the earthquake’s epicenter, was saved by the wide belt of mangroves, and only four people there died. Five villages 100km southeast of Banda Aceh in Julok were also saved by extensive mangroves in the area. In Sri Lanka also, it was observed that in areas where there were ‘green belts’, the damage was less or none at all. Although Maldives should have been the most vulnerable with very little of its land rising more than a couple of metres above sea level, only about 100 people died on its 1,190 islands while more than 25000 died in the neighbouring Sri Lanka. Local reports say that the tsunami passed right over the archipelago, briefly submerging it, but the waves, passing as a relatively gentle swell, hit the islands flat with little force. Most people were able to hold on and most of those swept out to sea were able to get back. They related this to the healthy coral reefs surrounding the islands, protected by strict government regulations. Burma, where much of the mangroves remain intact, appears to be far less affected than its neighbour, Thailand. Mangroves took the brunt of the attack, got ravaged and uprooted but they protected the people and villages. A ‘super-cyclone’ struck Orissa on India’s east coast in October 1999, killing at least 10,000 people and leaving 7.5 million homeless with 20ft waves crashing more than 12 miles inland. Area around Bhitarkanika, home to one of the world’s biggest forests, was largely spared while the worst of the damage was where mangroves had been destroyed. Planting of new mangroves along 70 miles of the Vietnamese coast protected the land behind them from the typhoon in 2000 and the worst floods in 2003. In 1960, a tsunami wave hit the coast in Bangladesh in an area where mangroves were intact and not a single human life was lost. These mangroves were subsequently cut down and replaced with shrimp farms. In 1991, thousands of people were killed when a tsunami of the same magnitude hit the same region. 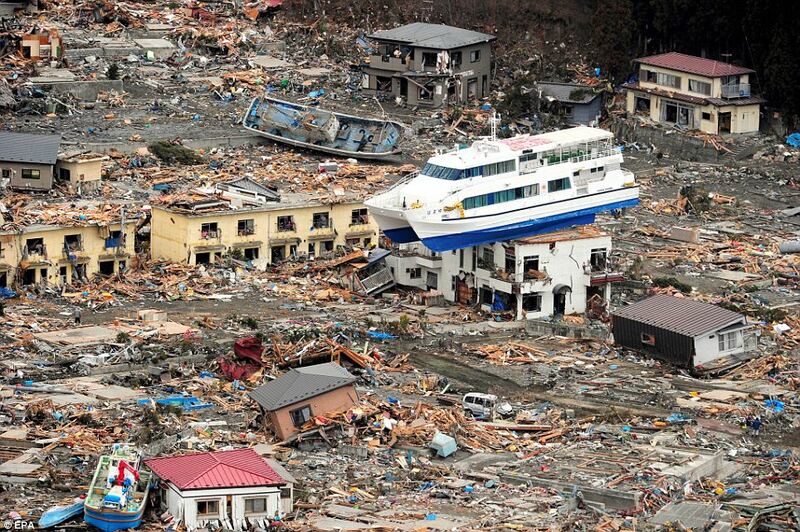 Man made structures could not withstand the fury of the tsunami, nor did they protect lives. Some deaths have been attributed to injuries sustained from these structures collapsing over inmates. Indian Air Force base in Car Nicobar island was completely destroyed. Many hotels, resorts and leisure homes along the coasts suffered extensive damage and could not stop the surging waters. Even steel-strengthened resorts in Thailand were badly damaged. Thousands of houses were destroyed and could not protect their inmates. Walls erected along the coastline could not stop the waves that broke over them. Many highways, bridges and roads were washed away. Concrete block homes were smashed to pieces in Somalia, far off from SE Asia. The coral reefs and mangrove swamps are double barrier of defence that nature provides against catastrophes from the sea. Mangroves, coral reefs and coastal forests together act as a ‘protective screen’ for the coastal system. The solid barriers of the reefs brake up and slow down the waves while the tangled roots and dense vegetation of the mangroves absorb much of their remaining energy. Although they can not prevent tsunami attacks, they could act as a buffer zone and dissipate much of the waves’ destructive energy before they reach the shore and protect the landward side, sheltering coastal communities and wildlife from the brunt of storms and waves. Tropical coastal ecosystem have sophisticated natural insurance mechanisms to help them survive the storm waves of Typhoon and tsunami. There is ample scientific evidence that clearly shows that a 15 meter tsunami wave’s destructive force is greatly dissipated as it passes through intact, healthy coastal zones containing coral, sea grass and mangroves. These ‘coastal greenbelts of protection’ also play a vital role in reducing sedimentation and shoreline erosion. Other important contributions include enhanced wild fisheries and marine life, medicines, fruit, honey, lumber, fuel wood, tannins and aesthetic beauty. Coral reefs are equivalent to natural breakwaters, providing a physical barrier that reaches the surface, causing waves to break offshore and allowing them to dissipate most of their destructive energy. It is estimated that globally, coral reefs provide US$9 billion annually in economic benefits associated with coastal protection. Mangroves grow in thickets along tropical coastlines between the high and low-water marks. Mangroves act as natural shock absorbers, dissipating the destructive wave energy and buffering against erosion. 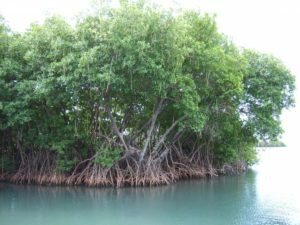 The first layer of red mangroves with their flexible branches and tangled roots hanging in the coastal waters absorb the first shock waves; the second layer of tall black mangroves then operates like a wall withstanding much of the sea’s fury. The volume of water reaching a point is greatly reduced since tsunami water, after entering into the mangroves, is distributed to all the canals and creeks that are present all over the mangroves. Their complicated dense root and branch structure efficiently bind the soil of the shore together and also trap the sediment in their roots, giving the seabed a shallow shape. This absorbs the energy of waves and tidal surges, protecting the land behind. Mangroves help to protect offshore coral reefs by filtering out the silt flowing seawards from the land. Mangroves in addition absorb more carbon dioxide per unit area than ocean phytoplankton, a critical factor in global warming. Trees along the coastline act as wave-tamers and form a barrier against wind. Tragically, the full fury and wrath of the tidal waves were felt in areas where nature’s green belts of coral reefs and mangroves no longer exist or were never present in the first place. Things might have been different had healthy mangrove forests, coral reefs, sea grass beds and peatlands been conserved in a healthy state along these coastlines. These vital protective buffers against wind and wave had been foolishly degraded or removed for unsustainable development. In many parts of the affected areas where dense mangroves and coral reefs have been replaced by townships, hotels and tourist resorts, golf courses, industries and shrimp farms (mainly to supply Western tables), transport infrastructure and coastal highways, housing, mansions, commercial developments and refineries. The neo liberal economic policies that pushed economic growth at the expanse of human life has contributed in no small measure to exacerbate the magnitude of the disaster. 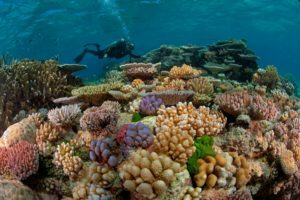 Large areas of coral reefs in the Indian Ocean region have suffered extensive damages due to climate change and human activities – waste water from new developments, dynamite fishing, sewage pollution, quarrying for building material and warmer water because of climate change. Only a third of the world’s coral reefs remain healthy and one-fifth of them have been destroyed completely. Half of the remaining reefs in the Indian Ocean are at risk. Since the 1960s, the Asian sea-coast region has been plundered by the large industrialised shrimp firms (largely funded by the World Bank). Nearly 72 per cent of the shrimp farming is confined to Asia: grown tenfold in the last 15 years, it is now a $9 billion industry. The expansion of shrimp farming was at the cost of tropical mangroves. Each acre of mangrove forest destroyed results in an estimated 676 pounds loss in marine harvest. Up to half of the world’s mangrove swamps have disappeared in the last 20-30 years. Indonesia had lost over 30 percent of its mangroves over the past 20 years, Thailand 50 percent, while Sri Lanka even more depleted. In India, mangrove cover has been reduced to less than a third of its original in the past three decades. Between 1963 and 1977, the period when aquaculture industry took roots, India destroyed nearly 50 per cent of its mangroves. Local communities were forcibly evicted to make way for the shrimp farms. Whatever remained of the mangroves was cut down by the hotel industry. Tourism boom in the Asia-Pacific region coincided with the destructive fallout of the growth in shrimp cultivation. Tourism growth, whether in the name of eco-tourism or leisure tourism, decimated the mangroves and destroyed the coral reefs. In the past two decades, the entire coastline along the Bay of Bengal, Arabian Sea, and Strait of Malacca in the Indian Ocean and all along the South Pacific Ocean has been a witness to massive investments in tourism and hotels. Myanmar and Maldives suffered very less from the killing spree of the tsunami because the tourism industry had so far not spread its tentacles to the virgin mangroves and coral reefs surrounding the coastline. The massive wave of destruction caused by the Dec 26 tsunami in 11 Asian countries alone has surpassed the economic gain that the shrimp industry claims to have harvested by several times. With over 1,50,000 people dead, the staggering social and economic loss will take some time to be ascertained. The fact that the natural barriers saved many lives should be a valuable lesson for all governments. Coastal zones and green belts such as mangroves, coral reefs and other natural barriers must be protected, regenerated and managed in a sustainable way. M S Swaminathan, one of India’s leading scientists, says that the world leaders should be paying even more attention to developing mangroves and other natural barriers than to a tsunami early-warning system. High-tech warning systems may be of little value when tsunami is generated, for though a warning could certainly save lives by giving a chance for tourists to get off the beaches and local people to head inland, it would do nothing to prevent wholesale destruction. On the other hand, it simply is not practical or economic in most cases to rebuild houses and infrastructure with the structural strength to withstand tsunamis. If the return period of events like this is 50 to 100 years, it is beyond the lifespans of most of the people involved and certainly longer than the life of most buildings in the tropics. Therefore, it is only through having such natural defenses that coastal communities can be protected in the long run. Tsunami defense preparations should include a range of coastal restoration projects including mangroves, sand dunes and indigenous fringe forests. Indonesia has already decided to replant huge swathes of mangrove forest along its vulnerable coastline. The government of Kerala state in India, observing that the tsunami left less destruction in regions protected by mangroves than barren and exposed beaches, has already started a project for insulating coasts with mangroves.